Don’t you just shake your head sometimes and wonder what I’m doing? I can imagine some of you saying -what in the world will she do with the screechingly (is that even a word?) awful pieces of fabric from the last post? A strange and loud tie dye creation? But I fooled you. 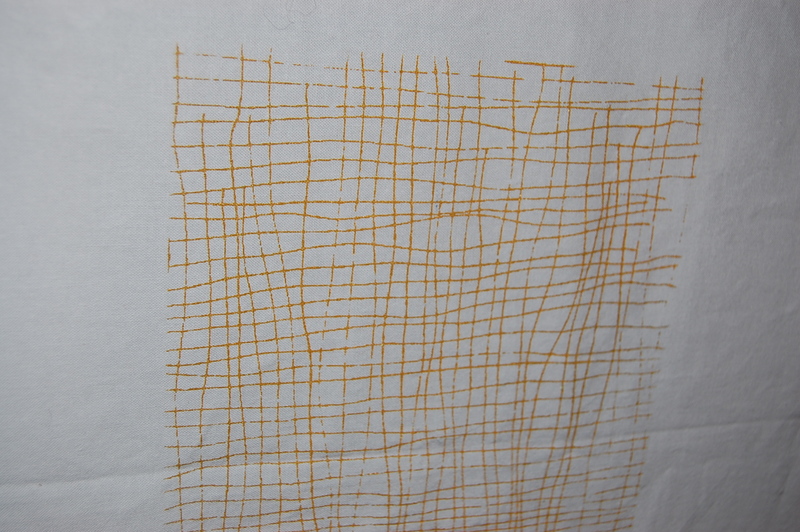 It was just the first layer and I have overdyed the batch to see what happens. Well, I suspected what would happen. And I was right. 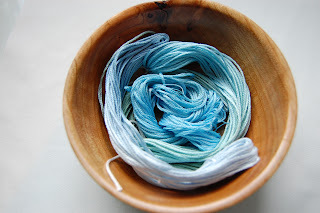 The deep colors I wanted for the next project. 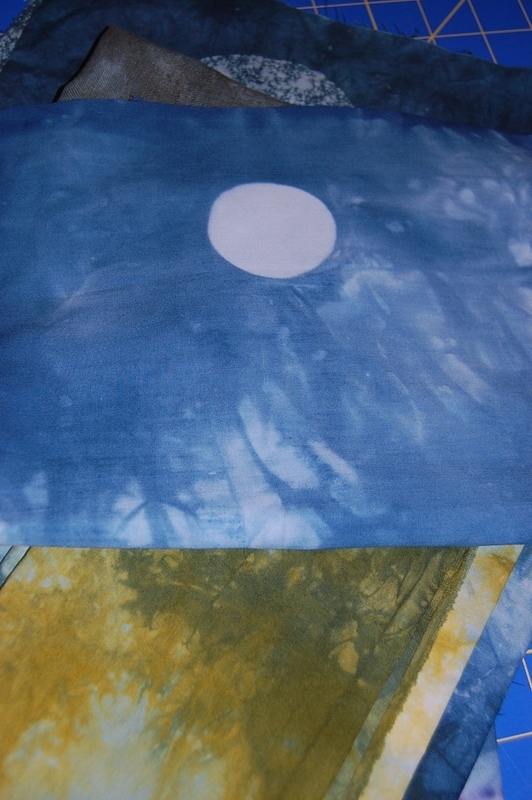 I also overdyed some snowdyed fabric which just didn’t turn out bright enough. Much better. 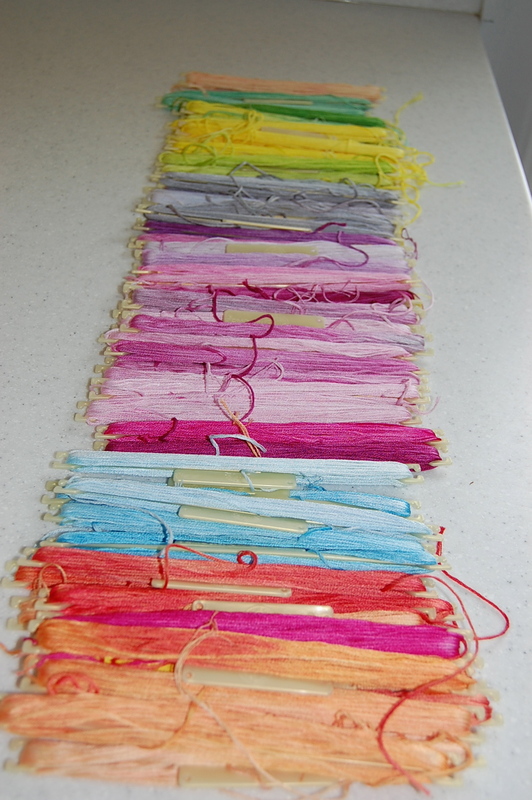 Also, finished up the rest of the floss. It is freezing in the garage which is where I do all the mixing and rinsing. I think I am good on dyeing for awhile. Just needed a fix of color in January. I need to get ahead writing my posts and taking pictures. I use to love to blog at 7:30 am but it’s still dark out here until about 8:15. So here I am at dinnertime :). 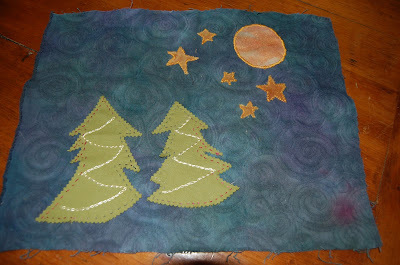 This entry was posted in fabric dyeing, hand dyed fabrics, hand embroidery on January 17, 2011 by Colleen Kole. Maybe it’s just because it’s winter. 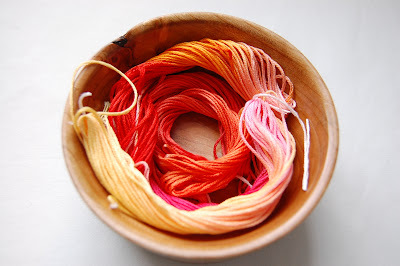 A few of my favorite hand dyed threads from this last batch. And against the starkness of the white snow, color is more appealing. I made this little piece at a workshop. Some people don’t finish workshop samplers. I do because I remember fondly my time there and it helps me to remember what I have learned. I like it better now that it has the added element of stitch. Stitch changes everything, doesn’t it? The colors are bright and bold. And that’s ok with me now. At the time I was comparing myself to others who were using subtler colors around me. Bold and bright is where I am at now. Color is just beautiful and I am having fun celebrating it this week. 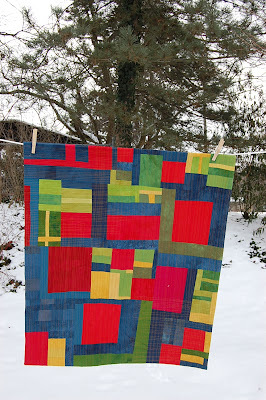 This entry was posted in hand dyed fabrics, hand embroidery, quilts 2011, surface design on January 13, 2011 by Colleen Kole. Beautiful things take time to make. Beautiful newly dyed embroidery thread. I started out only wanting to make red. But just let it go where it wanted to. Be creative, my friends! 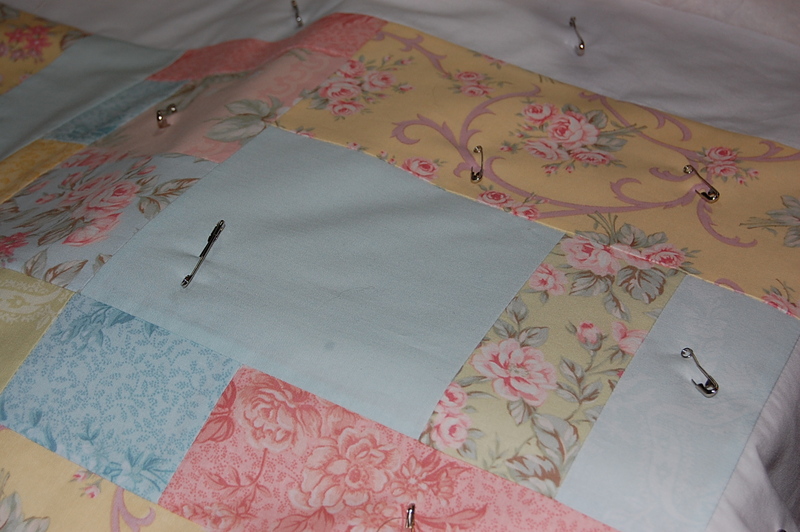 I am machine quilting today. How about you in all this snow? 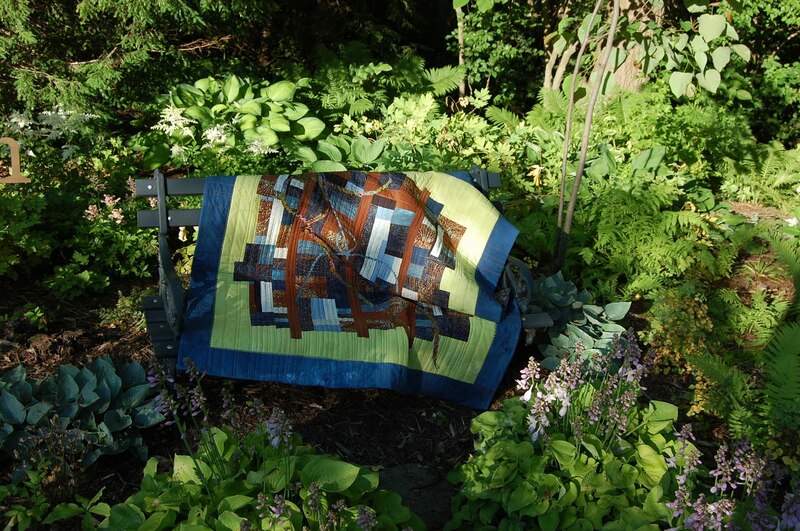 This entry was posted in hand dyes, hand embroidery on January 11, 2011 by Colleen Kole. Yes, I am on one this week. Hustling around trying to get the computer situation fixed. My computer guy is very disorganized and has cost me lots of extra time. Customer satisfaction is everything these days…Take care of the customer seems very easy, doesn’t it? One more trip back today to return something and then three will be working. I might cave and go for the big Apple for myself after this fiasco. And then my lab is sick and at the vet-she ate a cake on the front seat of my car-homemade and a gingerbread cake. Silly things -that as the vet says-she does this every December. Must not like how busy I am.
. Basting done for #5 which needs to be done before Christmas. I think #6 and #7 might be for the week after Christmas unless a huge chunk of time opens up. Haven’t given up yet. 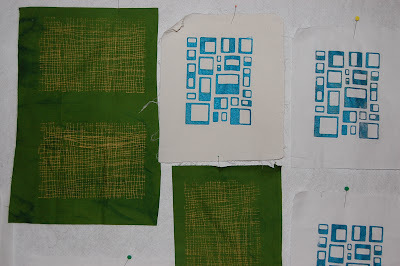 And trying some more screen printing. 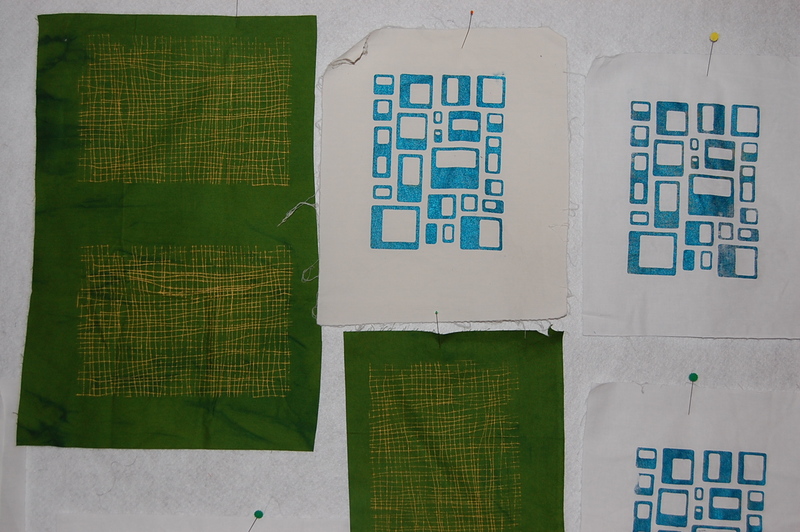 Screens from Lynne Krawczyk. Definitely addictive.15-30 minute bits of time in my studio. 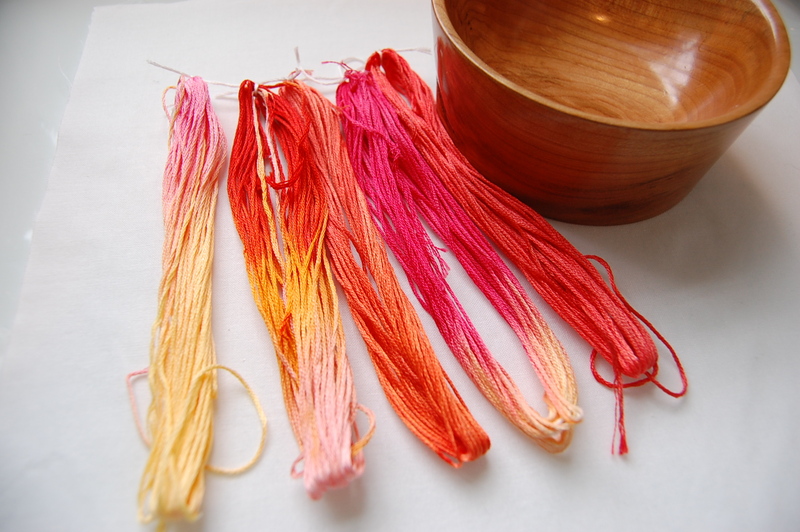 The first one is Fire and consists of 5 skeins of hand dyed DMC embroidery thread- 10$. The second is my favorite is : Spring Sky 5 skeins of hand dyed embroidery thread-10$. 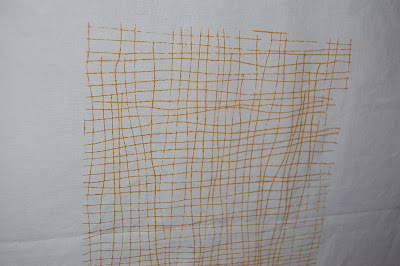 Great for hand stitching on your art quilts. E-mail me if you would like them. If not they will be on Etsy tomorrow. Whew -the weekend is almost here! ADD: Hand dyed thread is sold- more to come in my Etsy shop. This entry was posted in hand dyes, hand embroidery, Slow Cloth, surface design on December 10, 2010 by Colleen Kole. I am dreaming of the fairy that is going to get me off my duff , wave her magic wand and sprinkle lots of magic dust and then I will finish something wonderful. And then I will write this amazing blog post and have a million followers. Hah..my dream continues and ….I am amazingly productive, daringly creative and thin. But in my real life, I have just been trying to catch up. And keep up. And no matter how hard I was trying to dig out, I couldn’t make any headway. I have big gardens and they just needed to be thinned out and replanted. Nothing got done last fall because of my silly foot. And kids just needed to be kids and have a million kids over hanging a million wet towels all over the place. But the garden is ok for now. The kids have settled down a bit into summer and need less to just be and relax into summer laziness. So the finish fairy and I had a date this morning and at 7:56 am a finish was born. 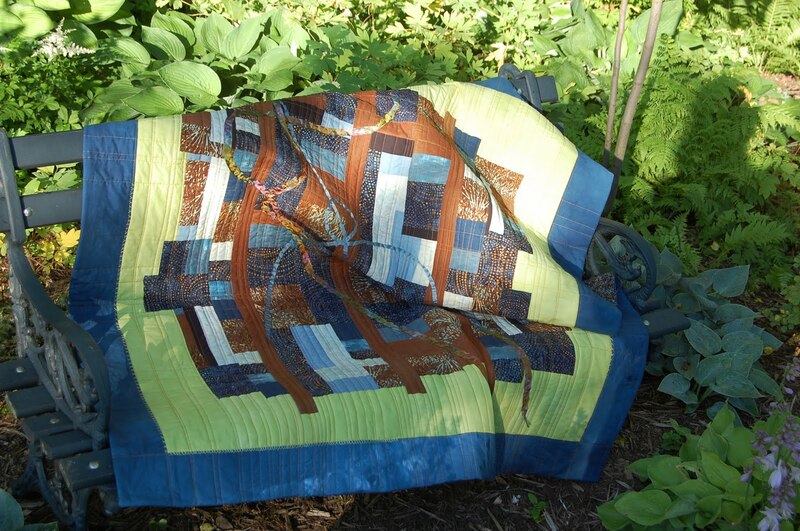 I used hand dyed cottons, commercial batiks, hand dyed silk ribbon, embroidery and machine quilting in this quilt. It is a commission that has been around for way too long. I really had trouble with this one. And it came down to the fact I just don’t like browns -it was hard for me. (and me procrastinating) A lot of stalls along the way waiting for our schedules to coincide for approval. (and me procrastinating) But once I got past that and did exactly what my friend wanted, it came together. She is happy with it and will be excited to have it. Actually-when she saw it last week she said it rocks. And her being happy with it is the only thing that mattered. Because it’s hers. I learned quite a bit from this process. 1. I was able to work with a color that was not my favorite. 2. I always underestimate how long it actually takes to complete a quilt from start to finish. 3. As long as they stay true to what I like design wise, I can do a commission and be satisfied with my results. And get paid for it. My yardwork is done too and now I am just going to enjoy a cup of coffee in my rocking chair on the porch. I can’t tell you how good I feel that this is DONE. This entry was posted in commissions, hand embroidery, hand quilting, improvisational quilting, machine quilting, quilts 2010 on June 21, 2010 by Colleen Kole. 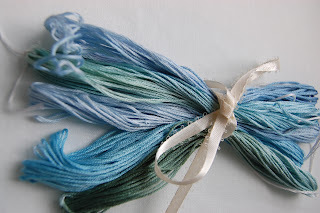 Despite my post from yesterday, I had a great time when Paula from PaulaArt recommended me for a Treasury at Etsy. It’s a means of putting together a group of items, displaying them for a short period of time and having people vote on them quickly. Take a look at the Treasury West and see all the great items. You can then click on all the items and the treasury with the most votes gets to be on the front page of it-until the next round. So easy to get lost there that it was nice of her to look out for me. Thank you Paula! I just wanted something simple. Any suggestions for the edge/binding? It’s over dyed upholstry fabric so I think it will be too thick for a flat art quilt binding. It’s for a simple home. This entry was posted in hand embroidery, quilts 2010, small works on February 4, 2010 by Colleen Kole.